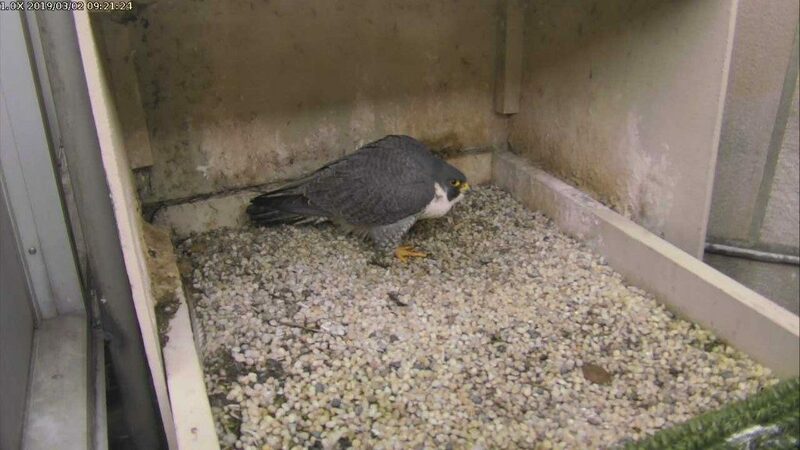 Hope, the female peregrine at Pitt’s Cathedral of Learning nest, looks as if she is ready to lay an egg. She hadn’t done so as of 2 March 2019 at 9:30a but she’s clearly getting ready. Her earliest egg date in the past has been March 6. Since I’m traveling in Hawaii right now I’ll probably miss the first egg moment but I know you’ll keep me posted. I think there is an egg in the nest! Looks like an egg in the nest! Just watched Hope lay an egg! About 17:20:35 on the clock. Yay! I just randomly checked the camera and Hope is standing over an egg! 5:30 pm.